I’ve mentioned several times that I don’t do much option trading. In certain specific situations, the leverage that options provide is just too tempting to pass up, but most of the time options are not a great investment. In fact, about three out of every four option contracts expire worthless, which is something you should think about the next time you consider buying options. But just because I haven’t bought any options in nearly a year doesn’t mean I don’t pay attention to the options market. In fact , I don’t have to go back too far at all to remember the last time something I saw in the options market gave me a good idea of what was to come in the stock market. On March 13, I wrote about unusual options trading in World Wrestling Entertainment. At the time, shares of WWE stock were trading at around $30, and everything was looking rosy for shareholders. The new WWE Network had just launched, the legendary Hulk Hogan had just resigned with the company in time for Wrestlemania, and shareholders were drooling over the new TV deal the company was negotiating for its weekly shows Raw and Smackdown. WWE’s Chief Strategy and Financial Officer George Barrios even compared the company’s pending TV deal to Nascar’s $820 million annual TV deal with Fox and NBC. Since WWE’s expiring contract was for only about $100 million, comparing the new deal to Nascar’s $800 million deal made it seem as if the sky was the limit for WWE stock. However, amid all the optimism, I noticed something strange happening with WWE options. 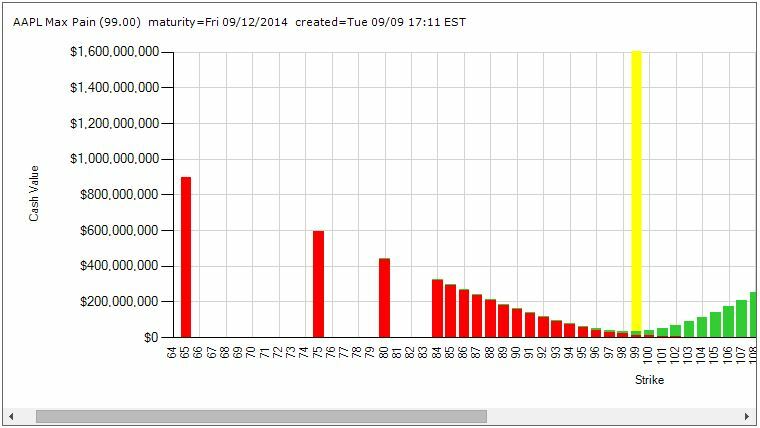 The open interest in each of the October 2014 put strike prices was less than 200. That is except for one: the $17.50 puts had an open interest of 7,535! With the share price at around $30 at the time, someone had a more than $1 million bet that WWE would be trading under $17.50 (a drop of over 40%) in about seven months! As crazy as it sounded to me at the time, after a disappointing $200 million TV deal and lackluster WWE Network launch, WWE stock did in fact tank. In fact, WWE dropped below $11 (a fall of 67% from its highs) at its lowest point before bouncing back a bit in recent weeks. But enough with the nostalgia. This week is all about Apple, my largest holding. Yesterday I poked a bit of fun at the day traders that were scrambling around all day yesterday trying to make heads or tails out of Apple’s unveiling event. I’m not a short-term trader. But I do care to a certain extent what happens to my stocks in the short-term. I mean, the long-term is nothing more than a series of short-terms, right? Apple closed pretty close to flat yesterday after swinging up and down wildly all day. Is the options market telling us anything about what to expect from the stock in the next few days? Just before Apple’s event started, John Najarian (the far superior Najarian) was on CNBC talking about a massive Apple call order that had just gone through. According to Najarian, someone (or some entity) bought 10,000 calls with a strike price of $107 that expire this Friday. These calls closed the day yesterday at $0.03, but they closed the prior day at $0.11. I don’t know exactly what they were trading at just prior to the event, but I think it’s safe to say that the majority of the 72% drop in price those options endured yesterday occurred after the Apple event began. But even if we assume conservatively that those calls only cost the buyer say $0.07, that means $7 per 100-share contract. Times 10,000 contracts. In other words, this was a (likely larger than) $70,000 bet that Apple stock would jump more than 7% in four days! I often look at options activity to tell me something about what options traders with deep pockets seem to think about the outlook for a stock. Of course, wealthy, savvy personal investors and institutions can be just as wrong about stock predictions as small retail investors like me. But the so-called “smart money” typically has more access to information and prediction tools than the rest of us, and it always makes me feel good to see the “big boys” on my side. That’s certainly how I felt about the 10,000-contract buy yesterday. However, in this case at least, Max Pain Theory is offering little comfort. Once again I’m thankful that I’m not a short-term trader. After what I heard from Tim Cook yesterday, particularly about Apple Pay, I wouldn’t lose any sleep if Apple stock pulls back a bit more in the upcoming days. The long-term future still looks very bright for Apple. However, to my deep-pocketed, call-buying fellow Apple bull: I’m rooting for ya, buddy. Here’s hoping for $107 AAPL shares by the end of this week! Want to learn how and why I made a 287% gain on my very first options trade in just a week? Or maybe you just want to be able to look sophisticated in front of your coworkers when they ask you what you are reading on your Kindle, and you’d prefer to tell them “Oh, I’m just reading a book about stock market analysis,” rather than the usual “Oh, I’m just looking at pics of my ex-girlfriend on Facebook.” For these reasons and more, check out my book, Beating Wall Street with Common Sense. I don’t have a degree in finance; I have a degree in neuroscience. You don’t have to predict what stocks will do if you can predict what traders will do and be one step ahead of them. I made a 400% return in the stock market over five years using only basic principles of psychology and common sense. Beating Wall Street with Common Sense is now available on Amazon, and tradingcommonsense.com is always available on your local internet! September 10, 2014 in Uncategorized.